The Moon's disk, even at partial phases, is intensely bright with reflected sunlight. The glare washes out most of the craters, rilles, and other surface details from view. 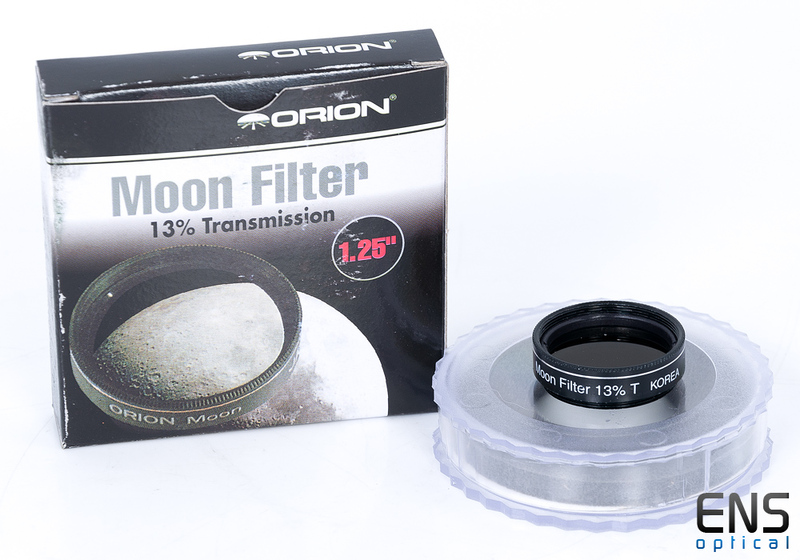 Our Moon Filter reduces the glare, allowing transmission of only 13% of the reflected light. Not only will you see more surface features, but you can study them in greater comfort. The filter reduces irradiation, which is the distortion at the boundary between light and dark areas, such as along the lunar terminator. The Orion Moon Filter is especially useful to owners of large-aperture scopes, in which the Moon's brightness can be overwhelming. It uniformly reduces light over the entire visible spectrum. Screws into threaded eyepiece barrel or 1.25" eyepieces and accessories.